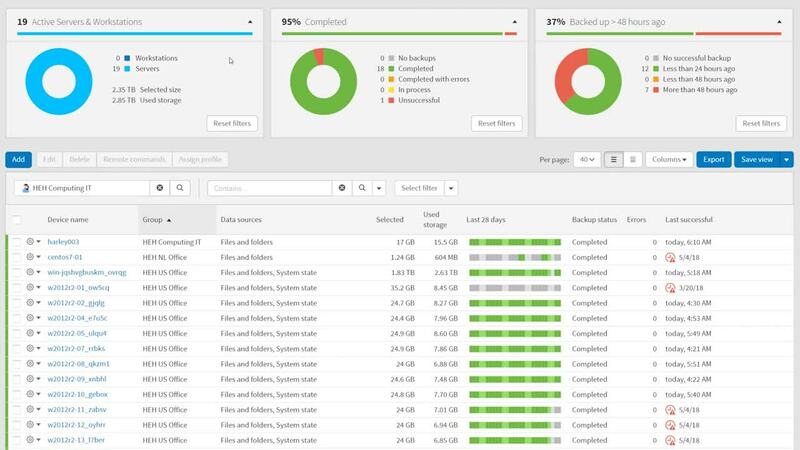 Introduction to the SolarWinds Backup management console. The best tools for managing IT deliver the exact information you want, where and when you need it. It must be simple to use. That's what we set out to do with SolarWinds Backup. To get started, launch your browser, navigate to backup.management, and enter your credentials to access your backup console. Across the top of the Management console are three charts that can be expanded into clickable, donut views. These charts are designed to give you at-a-glance visibility into your data protection environment, and allow you to drill down and view specific categories. The first chart provides a breakdown of active servers and workstations, and visibility into the amount of protected data. The next chart displays the most recent backup status for the current devices. Click on any piece of the chart or legend to drill down to a subset of devices. This shows you which backup devices have issues, and helps you identify and resolve those problems. The last chart helps you track policy compliance by visualizing how long since the last successful backup. Drilling down here shows devices that may be at risk. The Current Device view has a handful of default columns enabled to show health and status information about your devices. You can add more and rearrange them to create a custom view. Start by clicking the Columns drop-down menu, and adding a few new columns. You can expand categories and select them, or start typing a column name to filter them. For example, let's scroll down and expand Miscellaneous, and check Timestamp. Then, let's search for LSV (which is our Local SpeedVault) and check LSV Status. We will also add Profile and Profile Version before clicking Save. This flexibility lets you tailor the console to the exact information you want to see. You can further tune your current device view with filters. This way you only see the devices and information that matter to you. Now that you have exactly what you want, save the current view so it will be there the next time you log in. Just click the Save View button and name the view something descriptive. Click Save as New. You can access the dashboard views either from the navigation bar, or by clicking the Save View drop-down arrow. There are three default views provided. The ones you save will be added to this list. Any view can be scheduled to be emailed to you on a regular basis for reporting, alerting, or troubleshooting purposes. Click the Save View drop-down arrow and select Email View. Select email recipients and choose the view to be sent. Customize the email subject line, and select when you want the emails to be sent. Save, and you're finished. Since the SolarWinds Backup management console is web-based, you can access it from anywhere, even from a mobile device. This gives you the freedom to check backup status or do restores easily after hours or during on-call weekends. Now that you are familiar with the console, you are ready to explore how SolarWinds Backup delivers high performance and reliability while sending less data over the network. Click this link to see the next video.